The dwarf planet Pluto has five moons down to a detection limit of about 1 km in diameter. In order of distance from Pluto, they are Charon, Styx, Nix, Kerberos, and Hydra. Charon, the largest of the five moons, is mutually tidally locked with Pluto, and is massive enough that Pluto–Charon is sometimes considered a double dwarf planet. The innermost and largest moon, Charon, was discovered by James Christy on 22 June 1978, nearly half a century after Pluto was discovered. This led to a substantial revision in estimates of Pluto's size, which had previously assumed that the observed mass and reflected light of the system were all attributable to Pluto alone. Two additional moons were imaged by astronomers of the Pluto Companion Search Team preparing for the New Horizons mission and working with the Hubble Space Telescope on 15 May 2005, which received the provisional designations S/2005 P 1 and S/2005 P 2. The International Astronomical Union officially named these moons Nix (or Pluto II, the inner of the two moons, formerly P 2) and Hydra (Pluto III, the outer moon, formerly P 1), on 21 June 2006. Kerberos, announced on 20 July 2011, was discovered while searching for Plutonian rings. Styx, announced on 7 July 2012, was discovered while looking for potential hazards for New Horizons. The small moons to approximate scale, compared to Charon. Pluto and Charon, to scale. Photo taken by New Horizons on approach. Charon is about half the diameter of Pluto and is massive enough (nearly one eighth of the mass of Pluto) that the system's barycenter lies between them, approximately 960 km above Pluto's surface. [a] Charon and Pluto are also tidally locked, so that they always present the same face toward each other. The IAU General Assembly in August 2006 considered a proposal that Pluto and Charon be reclassified as a double planet, but the proposal was abandoned. 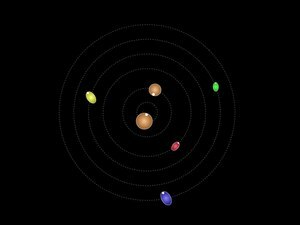 Pluto's four small moons orbit Pluto at two to four times the distance of Charon, ranging from Styx at 42,700 kilometres to Hydra at 64,800 kilometres from the barycenter of the system. They have nearly circular prograde orbits in the same orbital plane as Charon. All are much smaller than Charon. Nix and Hydra, the two larger, are roughly 42 and 55 kilometers on their longest axis respectively, and Styx and Kerberos are 7 and 12 kilometers respectively. All four are irregularly shaped. The relative masses of Pluto's moons. Charon dominates the system. Nix and Hydra are barely visible and Styx and Kerberos are invisible at this scale. An oblique schematic view of the Pluto–Charon system showing that Pluto orbits a point outside itself. Also visible is the mutual tidal locking between the two bodies. The Pluto system is highly compact and largely empty: Moons could potentially orbit Pluto at up to 53% (or 69%, if retrograde) of the Hill radius, the stable gravitational zone of Pluto's influence. For example, Psamathe orbits Neptune at 40% of the Hill radius. In the case of Pluto, only the inner 3% of the region where prograde orbits would be stable if occupied by satellites, and the region from Styx to Hydra is packed so tightly that there is little room for further moons with stable orbits. An intense search conducted by New Horizons confirmed that no moons larger than 4.5 km in diameter exist at the distances up to 180,000 km from Pluto (for smaller distances, this threshold is still smaller). The orbits of the moons are confirmed to be circular and coplanar, with inclinations differing less than 0.4° and eccentricities less than 0.005. The discovery of Nix and Hydra suggested that Pluto could have a ring system. Small-body impacts can create debris that can form into a ring system. However, data from a deep-optical survey by the Advanced Camera for Surveys on the Hubble Space Telescope, by occultation studies, and later by New Horizons, suggest that no ring system is present. librates about 180° with an amplitude of at least 10°. All of the outer circumbinary moons are also close to mean motion resonance with the Charon–Pluto orbital period. Styx, Nix, Kerberos, and Hydra are in a 1:3:4:5:6 sequence of near resonances, with Styx approximately 5.4% from its resonance, Nix approximately 2.7%, Kerberos approximately 0.6%, and Hydra approximately 0.3%. It may be that these orbits originated as forced resonances when Charon was tidally boosted into its current synchronous orbit, and then released from resonance as Charon's orbital eccentricity was tidally damped. The Pluto–Charon pair creates strong tidal forces, with the gravitational field at the outer moons varying by 15% peak to peak. However, it was calculated that a resonance with Charon could boost either Nix or Hydra into its current orbit, but not both: boosting Hydra would have required a near-zero Charonian eccentricity of 0.024, whereas boosting Nix would have required a larger eccentricity of at least 0.05. This suggests that Nix and Hydra were instead captured material, formed around Pluto–Charon, and migrated inward until they were trapped in resonance with Charon. The existence of Kerberos and Styx may support this idea. Configurations of Hydra (blue), Nix (red) and Styx (black) over one quarter of the cycle of their mutual orbital resonance. Movements are counterclockwise and orbits completed are tallied at upper right of diagrams (click on image to see the complete cycle). Prior to the New Horizon's mission Nix, Hydra, Styx, and Kerberos were predicted to rotate chaotically or tumble. However, New Horizons imaging found that they had not tidally spun down to near a spin synchronous state where chaotic rotation or tumbling would be expected. New Horizons imaging found that all 4 moons were at high obliquity. Either they were born that way, or they were tipped by a spin precession resonance. Styx may be experiencing intermittent and chaotic obliquity variations. Mark R. Showalter had speculated that, "Nix can flip its entire pole. It could actually be possible to spend a day on Nix in which the sun rises in the east and sets in the north. It is almost random-looking in the way it rotates." Only one other moon, Saturn's moon Hyperion, is known to tumble, though it is likely that Haumea's moons do so as well. Formation of Pluto's moons. 1: a Kuiper belt object approaches Pluto; 2: it impacts Pluto; 3: a dust ring forms around Pluto; 4: the debris aggregates to form Charon; 5: Pluto and Charon relax into spherical bodies. It is suspected that Pluto's satellite system was created by a massive collision, similar to the "big whack" thought to have created the Moon. In both cases, the high angular momenta of the moons can only be explained by such a scenario. The nearly circular orbits of the smaller moons suggests that they were also formed in this collision, rather than being captured Kuiper Belt objects. This and their near orbital resonances with Charon (see below) suggest that they formed closer to Pluto than they are at present and migrated outward as Charon reached its current orbit. Their grey color is different from that of Pluto, one of the reddest bodies in the Solar System. This is thought to be due to a loss of volatiles during the impact or subsequent coalescence, leaving the surfaces of the moons dominated by water ice. However, such an impact should have created additional debris (more moons), yet no moons or rings were discovered by New Horizons, ruling out any more moons of significant size orbiting Pluto. Pluto's moons are listed here by orbital period, from shortest to longest. Charon, which is massive enough to have collapsed into a spheroid at some point in its history, is highlighted in light purple. Pluto has been added for comparison. (*) All elements are with respect to the Pluto-Charon barycenter. The maximum distance between the centers of Pluto and Charon is 19,571 ± 4 km. Pluto and its five moons, including the location of the system's barycenter. Sizes and distances of the bodies are to scale (click on image for detail). Simulated view of Charon transiting Pluto on 25 February 1989. Transits occur when one of Pluto's moons passes between Pluto and the Sun. This occurs when one of the satellites' orbital nodes (the points where their orbits cross Pluto's ecliptic) lines up with Pluto and the Sun. This can only occur at two points in Pluto's orbit; coincidentally, these points are near Pluto's perihelion and aphelion. Occultations occur when Pluto passes in front of and blocks one of Pluto's satellites. Charon has an angular diameter of 4 degrees of arc as seen from the surface of Pluto; the Sun appears much smaller, only 39 to 65 arcseconds. Charon's proximity further ensures that a large proportion of Pluto's surface can experience an eclipse. Because Pluto always presents the same face towards Charon due to tidal locking, only the Charon-facing hemisphere experiences solar eclipses by Charon. The smaller moons can cast shadows elsewhere. The angular diameters of the four smaller moons (as seen from Pluto) are uncertain. Nix's is 3–9 minutes of arc and Hydra's is 2–7 minutes. These are much larger than the Sun's angular diameter, so total solar eclipses are caused by these moons. Eclipses by Styx and Kerberos are more difficult to estimate, as both moons are very irregular, with angular dimensions of 76.9 x 38.5 to 77.8 x 38.9 arcseconds for Styx, and 67.6 x 32.0 to 68.0 x 32.2 for Kerberos. As such, Styx has no annular eclipses, its widest axis being more than 10 arcseconds larger than the Sun at its largest. However, Kerberos, although slightly larger, cannot make total eclipses as its largest minor axis is a mere 32 arcseconds. Eclipses by Kerberos and Styx will entirely consist of partial and hybrid eclipses, with total eclipses being extremely rare. The next period of mutual events due to Charon will begin in October 2103, peak in 2110, and end in January 2117. During this period, solar eclipses will occur once each Plutonian day, with a maximum duration of 90 minutes. The Pluto system was visited by the New Horizons spacecraft in July 2015. Images with resolutions of up to 330 meters per pixel were returned of Nix and up to 1.1 kilometers per pixel of Hydra. Lower-resolution images were returned of Styx and Kerberos. Author Edmond Hamilton referred to three moons of Pluto in his 1940 novel Calling Captain Future, naming them Charon, Styx, and Cerberus. Charon was listed as the largest of them. All three moons would not be discovered until the year 1970, according to Hamilton. The real Charon was discovered in 1978. ^ The ratio of 18:22:33 in the 3-body resonance corresponds to a 2-body resonance with ratio 2:3 between Hydra and Nix. ^ The ratio of 18:22:33 in the 3-body resonance corresponds to a 2-body resonance with ratio 9:11 between Nix and Styx. In analogy, the ratio of 18:22:33 in the 3-body resonance corresponds to a 2-body resonance with ratio 6:11 between Hydra and Styx. ^ a b Orbital eccentricity and inclination of Pluto and Charon are equal because they refer to the same two-body problem (the gravitational influence of the smaller satellites is neglected here). ^ Many astronomers use this, Christy's pronunciation, rather than the classical /ˈkɛərɒn/, but both are acceptable. ^ a b Kenyon, Scott J.; Bromley, Benjamin C. (28 January 2019). "A Pluto-Charon Sonata: The Dynamical Architecture of the Circumbinary Satellite System". The Astrophysical Journal. 157 (2): 79. doi:10.3847/1538-3881/aafa72. ^ "Moons dance around Pluto". Smithsonian Institution. 9 June 2015. Retrieved 9 April 2016. ^ "Pluto's Moons | Five Satellites of Pluto". Space.com. Retrieved 27 October 2018. ^ Green, Daniel W. E. (21 June 2006). "Satellites of Pluto". IAU Circular. 8723. Retrieved 26 November 2011. "NASA's Hubble Discovers Another Moon Around Pluto". NASA. 20 July 2011. Retrieved 20 July 2011. ^ "Hubble Discovers a Fifth Moon Orbiting Pluto". hubblesite.org. 29 July 2012. Retrieved 29 July 2015. ^ Staff (30 January 2014). "Barycenter". Education.com. Retrieved 4 June 2015. ^ "The IAU draft definition of "planet" and "plutons"". International Astronomical Union. 16 August 2006. Retrieved 4 June 2015. ^ "New Horizons 'Captures' Two of Pluto's Smaller Moons". New Horizons. Retrieved 29 July 2015. ^ Steffl, A. J.; Mutchler, M. J.; Weaver, H. A.; Stern, S. A.; Durda, D. D.; Terrell, D.; Merline, W. J.; Young, L. A.; Young, E. F.; Buie, M. W.; Spencer, J. R. (2006). "New Constraints on Additional Satellites of the Pluto System". The Astronomical Journal. 132 (2): 614–619. arXiv:astro-ph/0511837. Bibcode:2006AJ....132..614S. doi:10.1086/505424. ^ Stern, S. Alan; Weaver, Harold A., Jr.; Steffl, Andrew J.; et al. (2005). "Characteristics and Origin of the Quadruple System at Pluto". Submitted to Nature. arXiv:astro-ph/0512599. Bibcode:2005astro.ph.12599S. ^ Kenyon, S. J. (3 June 2015). "Astronomy: Pluto leads the way in planet formation". Nature. 522 (7554): 40–41. Bibcode:2015Natur.522...40K. doi:10.1038/522040a. PMID 26040888. ^ "Orbits of 4 Bodies in Pluto System about Barycenter as Seen from Earth". Hubblesite. Retrieved 21 June 2006. ^ Pasachoff, Jay M.; Babcock, Bryce A.; Souza, Steven P.; et al. (2006). "A Search for Rings, Moons, or Debris in the Pluto System during the 2006 July 12 Occultation". Bulletin of the American Astronomical Society. 38 (3): 523. Bibcode:2006DPS....38.2502P. ^ a b c d e f g Showalter, M. R.; Hamilton, D. P. (3 June 2015). "Resonant interactions and chaotic rotation of Pluto's small moons". Nature. 522 (7554): 45–49. Bibcode:2015Natur.522...45S. doi:10.1038/nature14469. PMID 26040889. ^ Codex Regius (2016). Pluto & Charon. XinXii. p. 197. ISBN 9781534633520. Retrieved 13 March 2018. ^ Witze, Alexandra (2015). "Pluto's moons move in synchrony". Nature. doi:10.1038/nature.2015.17681. ^ Matson, J. (11 July 2012). "New Moon for Pluto: Hubble Telescope Spots a 5th Plutonian Satellite". Scientific American web site. Retrieved 12 July 2012. ^ Lithwick, Y.; Y. Wu (2008). "On the Origin of Pluto's Minor Moons, Nix and Hydra". arXiv:0802.2951 [astro-ph]. ^ Correia, A. C. M.; Leleu, A.; Rambaux, N.; Robutel, P. (2015). "Spin-orbit coupling and chaotic rotation for circumbinary bodies. Application to the small satellites of the Pluto-Charon system". Astronomy and Astrophysics. 580: L7. arXiv:1506.06733. Bibcode:2015A&A...580L..14C. doi:10.1051/0004-6361/201526800. Retrieved 16 January 2019. ^ a b Weaver, H. A. "The Small Satellites of Pluto as Observed by New Horizons". Science. 351: 1281. doi:10.1126/science.aae0030. ^ a b Quillen, A. C.; Nichols-Fleming, F.; Chen, Y.-Y. ; Noyelles, B. "Obliquity evolution of the minor satellites of Pluto and Charon". Icarus. 293: 94–113. ^ Chang, Kenneth (3 June 2015). "Astronomers Describe the Chaotic Dance of Pluto's Moons". New York Times. Retrieved 4 June 2015. ^ Wisdom, J.; Peale, S. J.; Mignard, F. (1984). "The chaotic rotation of Hyperion". Icarus. 58 (2): 137–152. Bibcode:1984Icar...58..137W. CiteSeerX 10.1.1.394.2728. doi:10.1016/0019-1035(84)90032-0. ^ Ragozzine, Darin (17 October 2016). "Rapidly Rotating Regular Satellites and Tides". Planetary Society. Retrieved 12 September 2017. ^ Canup, R. M. (8 January 2005). "A Giant Impact Origin of Pluto-Charon". Science. 307 (5709): 546–550. Bibcode:2005Sci...307..546C. doi:10.1126/science.1106818. PMID 15681378. Retrieved 20 July 2011. ^ Stern, S. A.; Weaver, H. A.; Steff, A. J.; Mutchler, M. J.; Merline, W. J.; Buie, M. W.; Young, E. F.; Young, L. A.; Spencer, J. R. (23 February 2006). "A giant impact origin for Pluto's small moons and satellite multiplicity in the Kuiper belt" (PDF). Nature. 439 (7079): 946–948. Bibcode:2006Natur.439..946S. doi:10.1038/nature04548. PMID 16495992. Archived from the original (PDF) on 19 January 2012. Retrieved 20 July 2011. ^ "(134340) Pluto, Charon, Nix, Hydra, Kerberos, and Styx". www.johnstonsarchive.net. Retrieved 22 June 2018. ^ Pluto data from D. R. Williams (7 September 2006). "Pluto Fact Sheet". NASA. Retrieved 24 March 2007. .
^ a b Verbiscer, A. J.; Porter, S. B.; Buratti, B. J.; Weaver, H. A.; Spencer, J. R.; Showalter, M. R.; Buie, M. W.; Hofgartner, J. D.; Hicks, M. D.; Ennico-Smith, K.; Olkin, C. B.; Stern, S. A.; Young, L. A.; Cheng, A. (2018). "Phase Curves of Nix and Hydra from the New Horizons Imaging Cameras". The Astrophysical Journal. 852 (2): L35. doi:10.3847/2041-8213/aaa486. ^ "End of Eclipse". JPL Solar System Simulator. 12 December 1987. Retrieved 29 July 2014. ^ Codex Regius (2016). Pluto & Charon. CreateSpace Independent Publishing Platform. ISBN 978-1534960749. Steffl, A. J.; Mutchler, M. J.; Weaver, H. A.; Stern, S. A.; Durda, D. D.; Terrell, D.; Merline, W. J.; Young, L. A.; Young, E. F.; Buie, M. W.; Spencer, J. R. (2006). "New Constraints on Additional Satellites of the Pluto System". The Astronomical Journal. 132 (2): 614–619. arXiv:astro-ph/0511837. Bibcode:2006AJ....132..614S. doi:10.1086/505424. Wikimedia Commons has media related to Moons of Pluto.